Address: CMH Kharian Medical College Kharian Cantt. 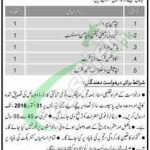 Get CMH Kharian Jobs 2018 Combined Military Hospital Pak Army Latest ISPR Vacancies are available on this page. Today on October 27, 2018, latest opportunities are published for the Pakistani Nationals who are willing to be part of the Pak Army related hospital or department. CMH Kharian is one of Pak Army operating hospital which is looking to hire educated and disciplined candidates for the positions such as (Admin Supervisor, Security / Maintenance / Admin Assistant, Hostel Warden, Accounts Clerk/Head Clerk, Admission/Student Affairs Clerk) for CMH Kharian Medical College, Kharian Cantt. Appointment of above-mentioned positions will be done on the pure contract basis. Candidates wanted to apply should compare themselves with the eligibilities mentioned in the following image and according to the criteria, candidates from Masters to Intermediate with relevant diplomas and experience is required to apply. So, viewers take advantage of this opportunity and make yourself part of such type of Army hospital, which offer handsome salary packages with fringe benefits to its employees. Now, in the following, you’ll have complete how to apply the procedure for the above-mentioned positions. Applications along with attested copies of educational certificate, diplomas, experience certificate, CNIC, domicile and recent photographs should reach CMH Kharian Cantt. The last date for submission of application is October 31, 2018. Position applied for should be mentioned clearly in the right corner of an envelope. Incomplete application or received after the due date will not be entertained. Last Date to Apply: October 31, 2018. Address: HR Admin Branch CMH Kharian Medical College Kharian Cantt.